Maggie has really gotten into playing dollhouse lately. She loves to get just about any character and pretend with them. That's why when I heard about the brand new Mini Lalaloopsy Silly Fun House Playset with Misty Mysterious I thought she'd really enjoy it. Mini Lalaloopsy Silly Fun House Playset with Misty Mysterious: The cuteness of Lalaloopsy is now fun house themed! 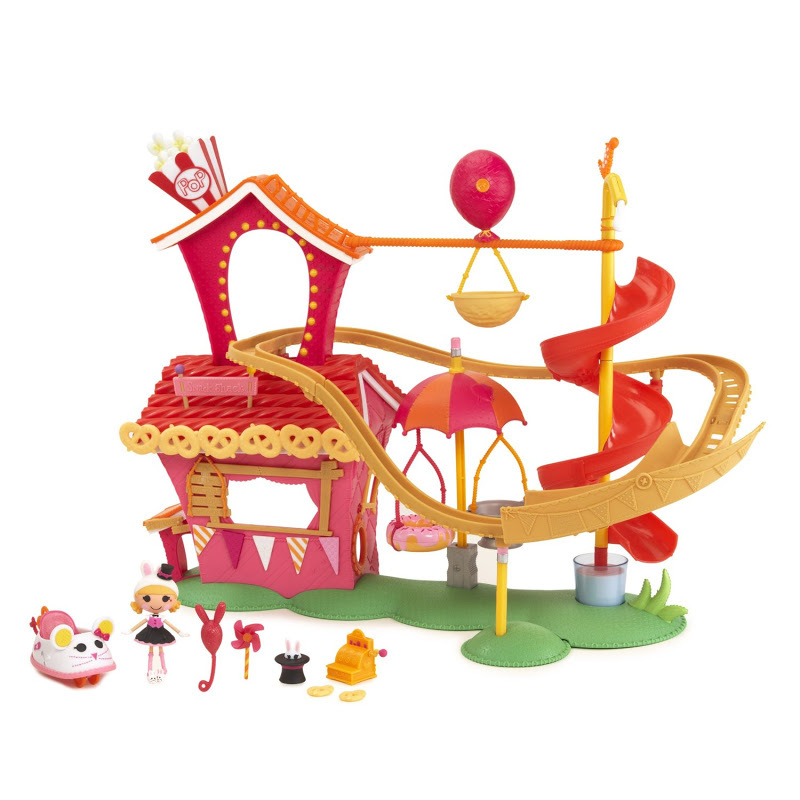 Play and explore in the Mini Lalaloopsy Fun House Playset where everything is silly, crazy, and just sew fun! 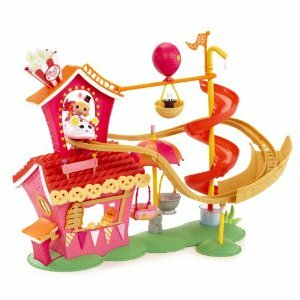 Product Features: Five Play Areas: rollercoaster track with removable car works in both directions; Zip line with belt balloon; Spinning swings; Twisty slide; snack shack; Pop Popcorn. Includes exclusive doll and pet; 5 fun house accessories. Ages: 4-104! Maggie is almost 3 years old, so she's still a little bit younger than the recommended age for this toy. Because there are a lot of small pieces and some assembly, this was a toy that I played with, with her. She has a second mini Lalaloopsy doll, so it worked out well for both of us to play. We had a blast together pretending about our dolls visiting the carnival! The mini Lalaloopsy character that comes with the set is Misty Mysterious, however any of the mini Lalaloopsy character will work well for this set (there are a number of characters sold separately that you can purchase for additional playing fun). The dolls fit in the little rollercoaster car and that was Maggie's favorite feature. You can push the car in either direction around the track. There is also a little carousel/swing toy where you can spin the characters and a twisty slide for them as well. At the concession stand (that even has a little cash register!) the characters can buy pretzels, a balloon, or even a pinwheel. Part of the roller coaster track is held up by a stick (looks like a half pencil--you should be able to see it in the picture) and a smaller green patch of "grass." The track is meant to come apart for easy storage, so this pencil part comes off as well. We did find that it did not stay in place the best, and for a younger child like Maggie she got frustrated with that at times so it was good that I was there to help her put it back together. An older girl would have an easier time fixing it I believe, so I don't think it would be too much of an issue. This toy has a number of tiny pieces, so if you have a small baby in the house like we do, you'll want to make sure that your older child plays with it out of reach of any young children. Besides the additional dolls, you can also purchase toys, like a Ferris wheel, to make your carnival complete! We've had a lot of fun with this toy, so much so, that I think Santa will be bringing more pieces to Maggie for Christmas! The Mini Lalaloopsy Silly Fun House Playset with Misty Mysterious has a retail price of $42.99. You can purchase it online or at your favorite retail store. One lucky reader will also WIN one! If you'd like a chance to win, just fill out the easy Rafflecopter entry form below. Good luck! My daughter's favorite Lalaloopsy is the color-changing Mermaid doll! Coral Sea Shells is cute! My favorite is Prairie Dusty Trails with her cute pigtails.